The best selling Kayfun replica is now back in stock! saying they are better then the Russian and are built just as well. 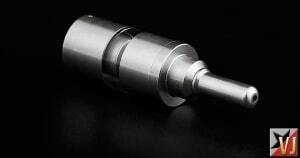 This is being touted as the best Kayfun style experience – period. WHATS THE DIFFERENCE VS PREVIOUS EDITIONS? IMPROVED METAL BOTTOM AIR FLOW CONTROL SYSTEM! LIFT UP AIR CHANNEL SCREW TO AVOID LEAKING FROM CHAMBER! IMPROVED O RINGS AND DRIP TIP. COMES WITH CLEAR AND METAL TANKS! “BLACK EDITION” RETAIL GIFT BOX.